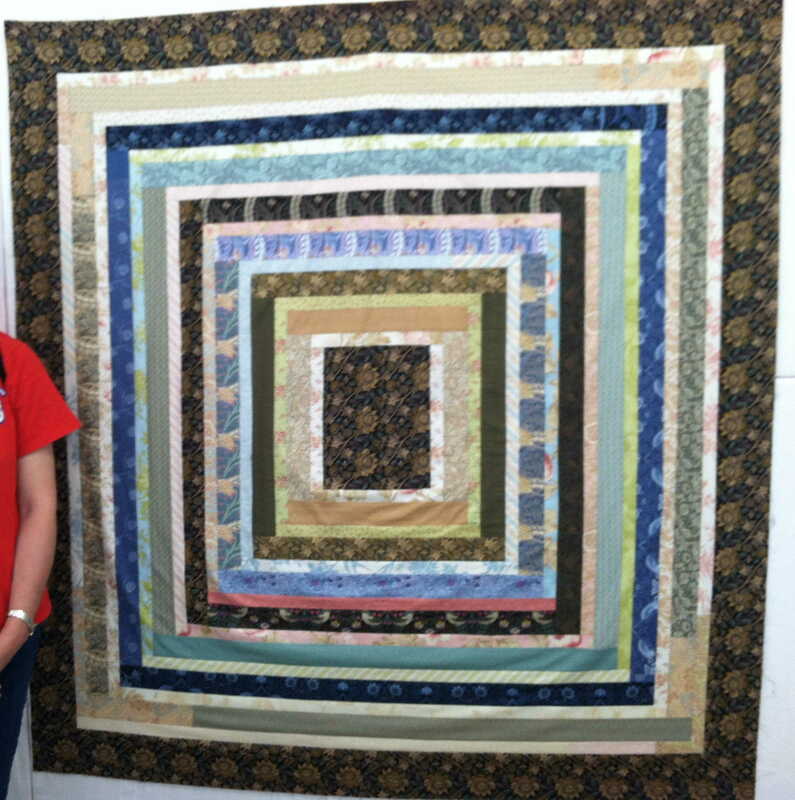 The quilting retreat is going along great! We are all sewing, cutting, designing, starting, finishing, binding, learning, teaching, sharing and generally having the best time ever. It’s amazing what 15 motivated women can accomplish in 4 days! Please have a look at some of the beautiful projects this fantastic group has been working on. 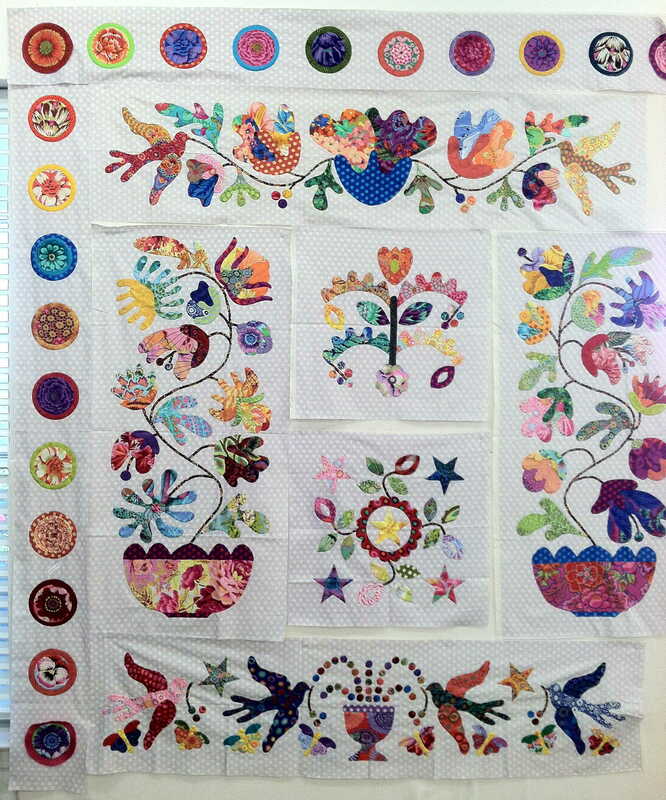 This quilt is all hand applique – stunning! And the colors are fantastic! This is a bed size quilt. I love the color palette. It’s like an optical illusion. This one I helped to lay out. What fun it was to play with all those colors and try to keep it balanced! Even though this one isn’t quite done, you can see how magnificent it is going to be. Love the contrast between light and dark! This one is so bright and colorful! Very fun and youthful! And those perfect points! 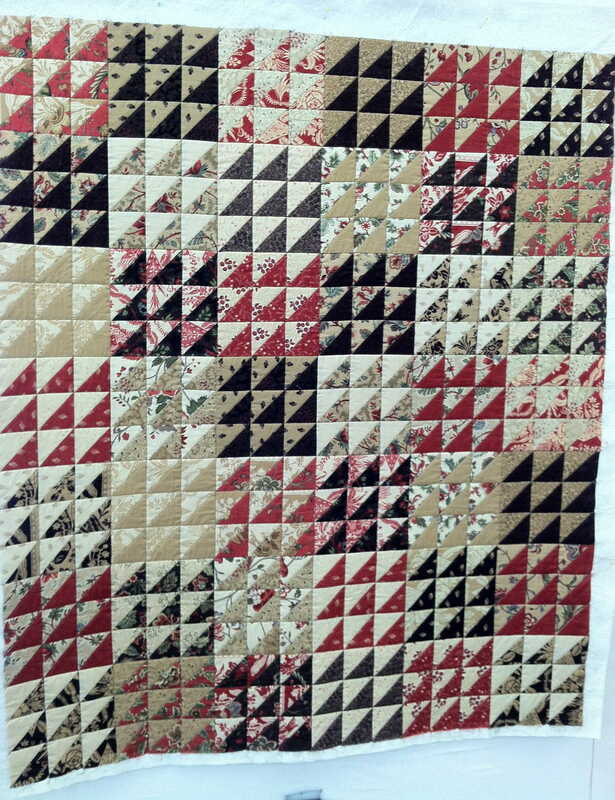 This is an old pattern with reproduction fabrics. Very charming! Black, white and pink cows – does it get any cuter?! What a grand mix of styles and color palettes. Love! 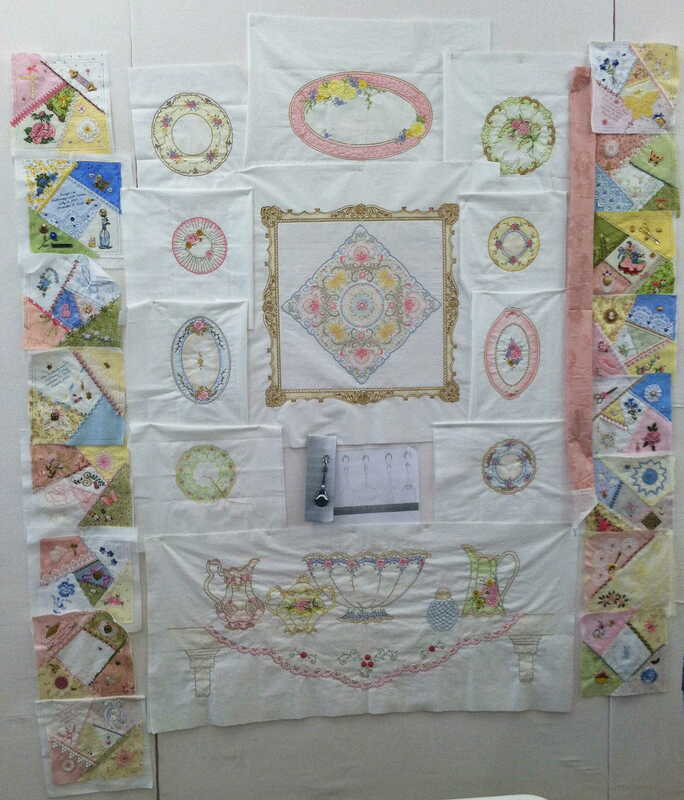 This magnificent work in progress is a tribute to the quilter’s mother, grandmother and aunt. She copied her dish patterns and used family heirloom hankies and jewelry. Tons of hand embroidery and crazy patches. There are no words! Just feast your eyes! Are these spectacular or what? I believe spectacular is an inadequate word! But I can’t find the word that IS adequate for the magnificent results I’ve seen from these last days. It’s hard to believe all this comes from humming machines, clipping scissors, quiet hands with needles and low-key consultations. You would think sparks and fireworks would be going off to produce such unbelievable products! Everyone sits in their own little space with their own sewing machine and all their fabric. We all laugh and talk almost constantly but work is going on almost unseen. 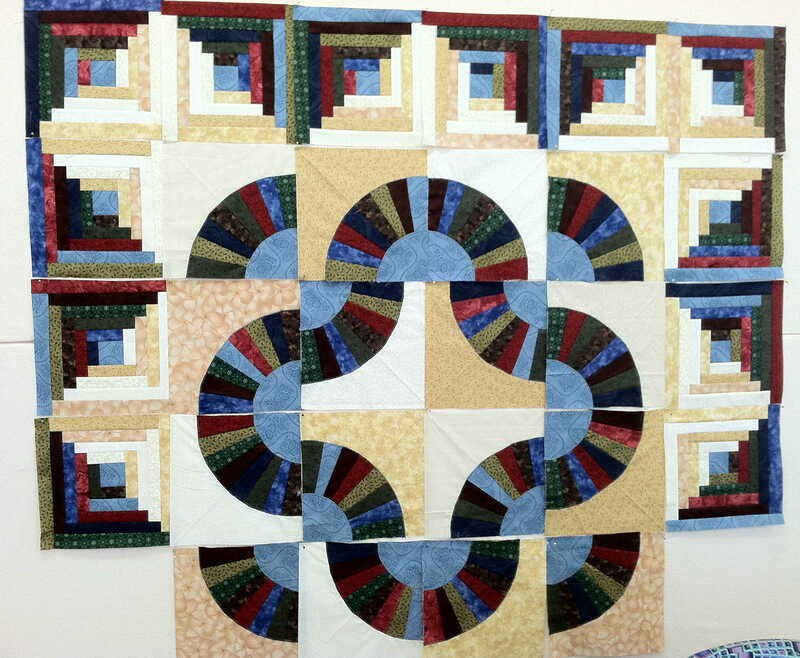 Before long, quilt squares start appearing on design walls all over the room. 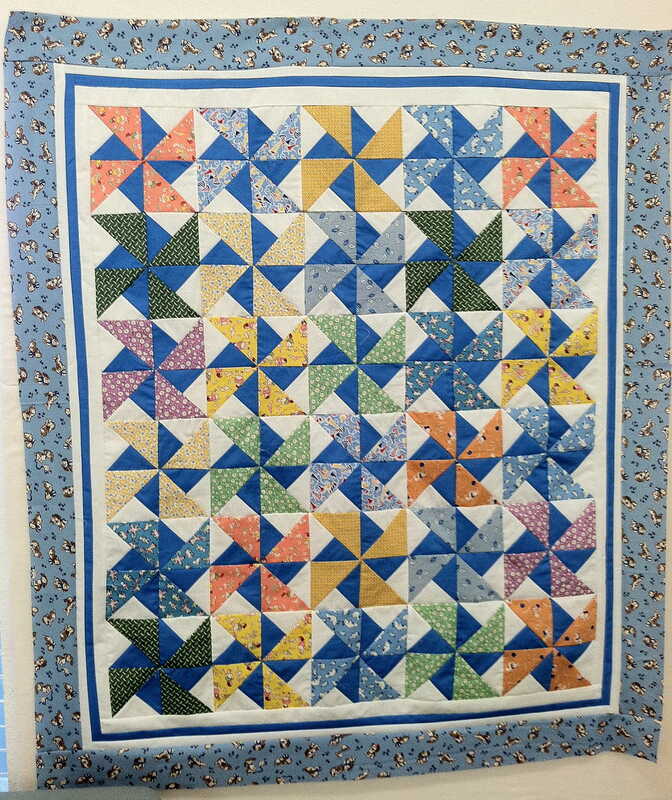 In a day or two some quilt tops are completed and some small quilts are even finished with binding. Astounding, really! New projects are started and large projects are continued throughout the retreat. If a new notion is found to be helpful, it is shared with everyone. If a source for fabric or trim is discovered, it is public knowledge within hours. If someone needs red thread, they will find numerous spools at their spot in minutes. If you can’t remember how to miter a corner, every neighbor will give you a refresher course. 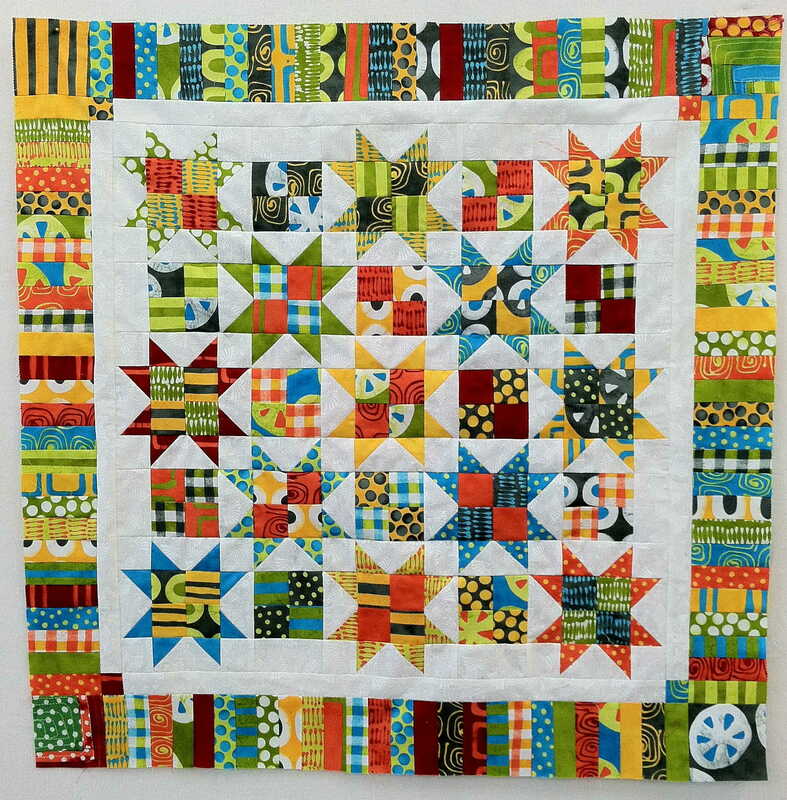 And when your squares go up on the wall and start forming a quilt, you will receive more appreciation and applause than you know what to do with. Doesn’t this sound like heaven? AND we don’t have to cook or do laundry! For real! It somehow feels like a mini lifetime experienced in 4 days, between the other parts of my real life. Every retreat has been a true mountaintop experience for me. The combination of people has made each one unique but all truly special. 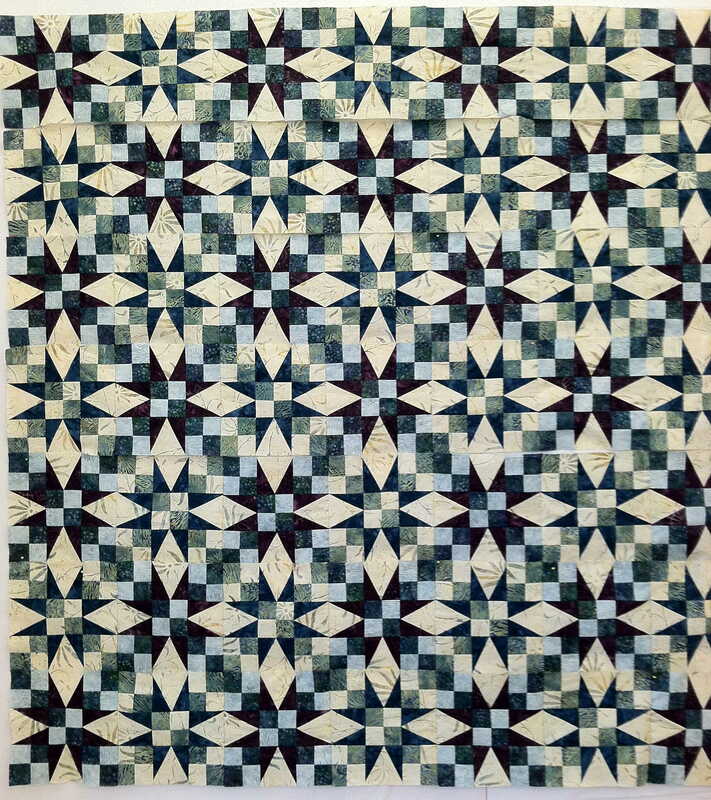 It mirrors the feelings I have for the quilts themselves. They are all unique, special, magnificent and include their own story. Each one, new or old, requires creative thought, deliberate planning, careful measuring, precise cutting, skillful sewing and lots and lots of love. Each needs specific colors, hues, tones, patterns and motifs. Each has a story stitched into it, between the top and bottom layers. We may not always know it but it is there. The story of who made it, where, with what, for whom and when stays with the quilt. Even after many years, dozens of washings, being hugged, dragged on the floor or becoming frayed and raggedy, the story is always there. 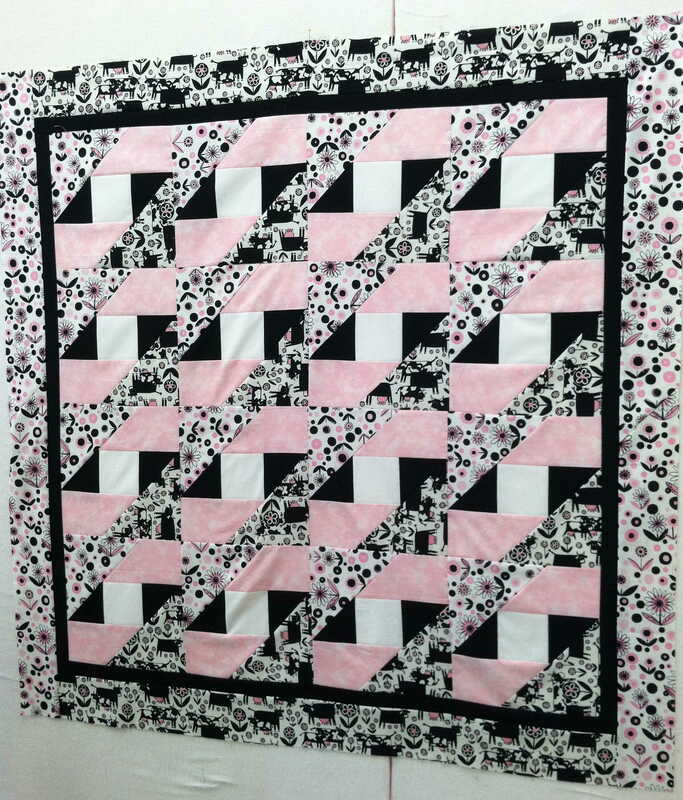 It can always be felt in the softness, warmth and cozy comfort each quilt provides through touch. Just sleep under a quilt or wrap yourself in one and you will understand what I mean. You can actually feel the history! I know I can! 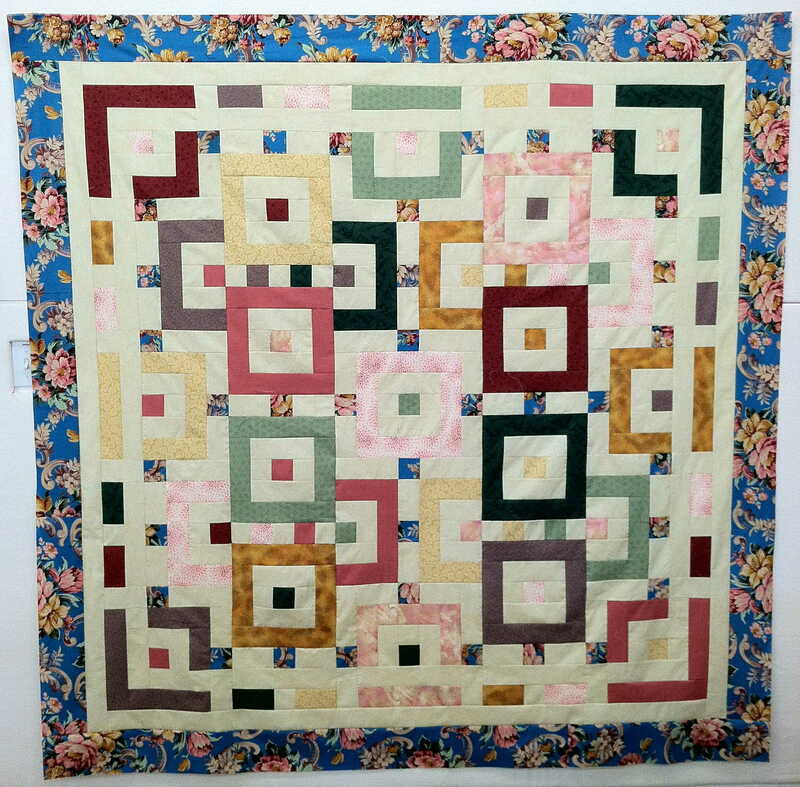 I hope every quilt I make oozes with all the love, hope and care I sew into it. 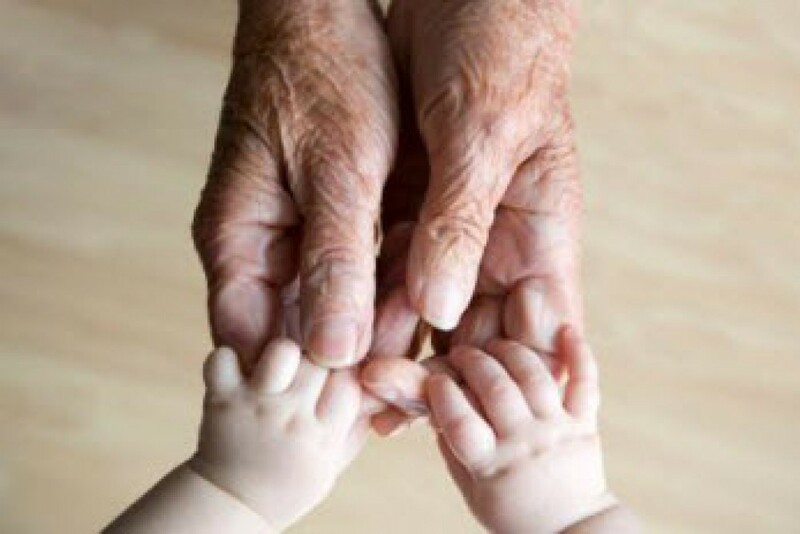 I want my kids to hold pieces of their childhood in their hands and remember the splendid times of our family. I pray my grandkids smile when they see their quilts and want to sit on them, play on them and sleep on them until they need repair. Which I will gladly do and sew on patches to add to the story. I plan for these quilts to be handed down, generation by generation. Not that they’re so perfect but they tell my story. Long after I am gone, my quilt stories will go on. And that makes me so very happy!